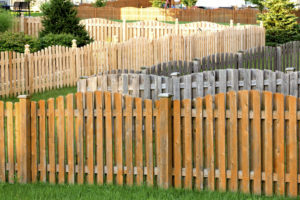 Fences provide privacy in your neighborhood and can give your little ones or pets a perfect place to play in your yard. Fences provide privacy in your neighborhood and can give your little ones or pets a perfect place to play in your yard. However, they are an investment and require considerations and pre-planning to ensure your new fence is not just well-built, but you are allowed to have one. To build your new fence as cost-effectively as possible, there are a few things you must check; otherwise, you could cost yourself a pretty penny trying to fix your mistakes or, worst case scenario, paying to remove your brand-new fence. Here are a few tips to help you navigate the varying costs and considerations of building a fence, so you don’t waste your money and can enjoy your fence for as long as possible. Requirements for fencing vary from county to county, so before you invest anything in materials, it’s critical to know that you have permission to build a new fence. Make sure to check all of the local zoning laws in your county before considering a new fence. There may also be height limitations or boundary requirements to consider for fences as well. Knowing your property lines is extremely helpful, and if you’re unsure you can get a survey done. After checking zoning laws, if you live in a neighborhood with a Homeowner’s Association (HOA), it’s good to verify fence requirements with them too, as they may have even stricter guidelines about types of fences you can install on your property, down to colors and materials you can use. Building a new fence requires digging in your yard, and any excavation in your yard poses a risk for hitting pipes or wires buried there. Although this seems pretty straightforward, it often gets bypassed in the planning process. Forgetting to mark off utilities could not just be a costly mistake if you hit pipes or wires, but if your fence gets built on top of your utility lines, your new fence could get ripped out if the county needs to do repair work—Yikes! Now that you know you’re allowed to build your fence, you know what specs you need to meet, and you know where your utility lines are, here comes the fun part! There are lots of materials you can use, from wrought iron to vinyl that come with varying maintenance requirements. If your HOA allows for a variety of colors, a wood fence may be the best option because you can customize a wood fence with different stains, etc. A vinyl fence may be a pricier option upfront, but requires little maintenance and will last longer than wood. Keep in mind that a cheap upfront option may not be the most cost-effective in the long run. It’s best to consult a professional about what the best type of fence is for your needs. This entry was posted on Friday, November 17th, 2017 at 6:06 pm. Both comments and pings are currently closed.